is a person’s public commitment to a particular group of believers. defines and builds the team that is ready to do the work of the church. offers a support system when people are going through difficult times. provides opportunities for spiritual growth under the guidance and accountability of other church members. challenges believers to use their God-given spiritual gifts alongside others God has placed in the church. grants permission to believers to offer input and direction for a local church body. 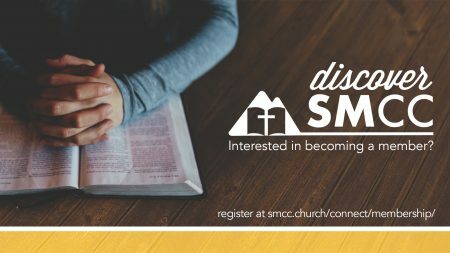 The first step of the membership process at SMCC is to attend Discover SMCC, a fun and informative time where you can get to know who we are and what we believe, as well as ask any questions you may have. Attending this class doesn’t commit you to membership; it’s merely a starting place to get more information and get to know SMCC a little better! Following this time, if you believe God is leading you to become a member of SMCC, we’ll ask you to complete the Application for Church Membership, and then meet with one of our elders, who will give you the opportunity to sign our membership covenant. Watch this page for information on our next class. In the meantime, if you have questions about membership, please contact Gina Cody in the Pastor’s Office. *Lawless, Chuck, Membership Matters, Michigan: Zondervan, 2005, print.